When setting up security, each Laserfiche repository will be different and have different requirements to consider. Without careful planning and regular updates as your site grows and changes, your system may become chaotic and unsecured. To keep this from happening, have the following recommendations in mind when setting up Laserfiche security. There are various ways that users can be authenticated into the Laserfiche system. 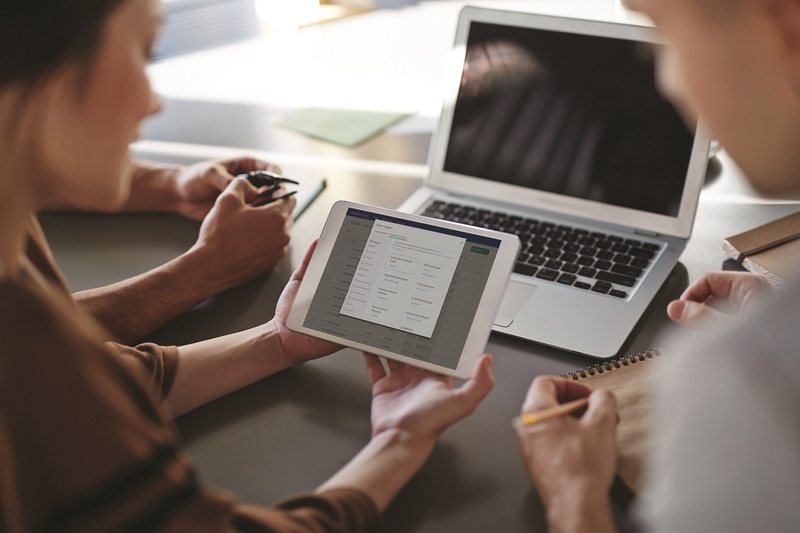 Administrators can use existing Windows or LDAP directory accounts, add Laserfiche directory accounts via the Laserfiche Rio Directory Server, or create repository specific accounts. If a Windows account for a new user has been created on the domain, this account will subsequently—and automatically—be added to Laserfiche under the very same Windows group. If a user leaves the organization, the administrator can simply disable or remove that person’s domain account. The user will then be automatically removed from Laserfiche. Users with a directory account can use the same license to access any repository at the site, when they have sufficient Laserfiche rights. Directory accounts can be added to Laserfiche or repository groups. It is possible for a user to be in more than one group at the same time, and for one group to be a member of another group. You can use this to assign several sets of rights to the same user. For example, a manager in the accounting department could be a member of the “Managers” group, which assigns rights and privileges, as well as the “Accounting” group, which has access to accounting department folders. Entry access rights determine the operations that a user can perform on folders or documents. For example, users may be able to read invoices, but not edit or delete them. It is a best practice to assign entry access rights to groups rather than individual users. This way, you can simply add users to groups and they will automatically be assigned the correct rights. Who: Figure out which users need to be in which group. By department. For example, members of the sales department have different rights than members of the accounting department. By role. For example, administrators have different rights than scanner operators. Users can be members of more than one group. In that case, security will be calculated based on the rights assigned to all relevant groups. This way, if a new person is hired, simply add them to the appropriate group and they will automatically inherit the correct security. What and how much: Figure out what content needs to be accessed by which group and how much access they should have. For example, members of the accounting department need to create, read and modify financial statements, but most other departments don’t even need to know where the financial statements are stored. If a user is not granted a right but is also not denied that right, they will not be able to perform the action. However, they can still inherit the ability to perform the action from another group. If a user is denied a right, either on the user itself or via group membership, that deny will take precedence. Even if they have been allowed that right via a different group, they will still not have that right. In general, it is a best practice to simply not allow a right if a user should not be able to do something, rather than explicitly denying it. Explicit denies should be used primarily for exception cases. Scope: Apply entry access rights at the broadest level possible while still restricting access in the way that you need. Use the scope “This folder, subfolders and documents” to easily grant or deny access to entire sections of your folder tree. Then restrict access based on which folders you want particular groups to have the ability to access. Example: If you want everyone to have access to everything in the “Human Resources” folder, then assign them the “This folder, subfolders and documents” scope. If you want them to have access to everything except for the folders and documents in the “Annual Review Information” folder, then assign scope to be the “Human Resources” folder and its immediate children. 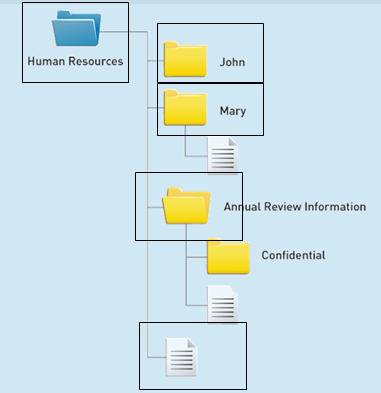 Use the folder tree to organize your security, with certain sections of the tree being accessible to certain groups, and use scope to grant only the appropriate sections to the appropriate groups. 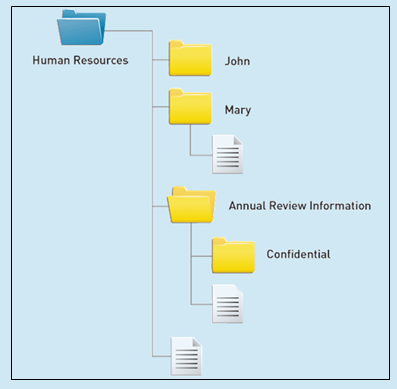 Create structures with restricted rights at higher levels and more permissive rights at lower levels of the folder tree. Where: Simplify granting security by making sure documents with similar security needs are stored in the same folder. We strongly recommend setting security at the folder level rather than at the document level. This helps to ensure that your security settings remain consistent, that new documents are created with appropriate security automatically, and that any security issues you might encounter are easy to troubleshoot. After setting up security on a folder, assuming you’ve considered scope correctly, users will automatically have the appropriate rights to the documents residing in it. Privileges are special account rights that grant the ability to perform operations dealing with the management of a Laserfiche repository. Privileges can be divided among different types of administrators. For example, a high-level administrator can be granted Manage Entry Access and Manage Metadata privileges while a department manager will have Manage Templates and Fields and Manage Stamps. Some privileges have repercussions across the entire repository. For example, a user with the Manage Tags privilege can grant security tags, and a user with the Manage Entry Access privilege can browse the entire repository. The number one rule about privileges is: know what a privilege does before you grant it. Since all users will always be part of the “Everyone” group, you should give it only very limited security access. If you will be using the Folder Filter Expressions advanced security feature, or restricting the Browse right for certain folders, you will need to remove the relevant privilege from the “Everyone” group. Otherwise, it is recommended that you leave these privileges in place. Since it is a best practice to grant entry access rights to particular folders, not individual documents, if you want to control access to documents regardless of where they are located in the folder tree, you can use security tags. A security tag ensures that only users who have been granted that tag will be able to see documents that have that tag applied to them, regardless of where the document is in the repository. Require more restricted access than other documents in the same folder. Are special cases or require special handling. Will move through many folders during their life cycle. Security tags will not be inherited by documents in a folder if they are applied to a folder. In general, security tags should be applied only to documents, not to folders. Feature rights provide administrators with the ability to enable or disable certain functions for users across the entire repository. For example, the Scan feature right controls a user’s ability to scan documents. If they do not have the Scan feature right on a folder, they will not be able to scan new documents into that folder, even if they have sufficient entry access rights to create documents at that location. Feature rights are best used when you want to simplify a user’s experience by disabling functions across the whole repository. Laserfiche gives you the ability to configure access to specific parts of your repository, such as the volume files, fields, and templates. In general, these access rights have reasonable default values; if you don’t have a reason to need to restrict access to documents based on their volume, you do not need to configure volume security and can use the default values. However, they are useful for exception cases. For example, you may want to use security to hide sensitive field values, such as social security numbers. Remember that a user needs to have all applicable rights in order to perform a particular task. For example, to open a document and view its pages, a user needs a combination of the appropriate entry access and volume access rights.